Over the past decade we’ve wised up, swapping microwaved TV dinner trays for fresh vegetables and balancing yoga poses with lean protein. Our evolving perspective on the traditional American diet has bolstered our understanding of the undeniable power that food has on health. This journey to better health has been all-inclusive, spanning across multiple generations and taking shape in schools and communities across the country. But while we’ve become skilled at deciphering labels in our grocery store aisles, our dogs have been eating from the same bulky mystery bags for years. Commercial pet food brands — yes, even the “organic” or “all-natural” varieties — are all so highly processed that the nutritional value of any individual organic ingredient is lost by the time it hits your dog’s bowl. Feed grade ingredients require heavy processing to kill bacteria, whereas human grade ingredients are packed with fresh, natural nutrients. While dogs can survive on traditional dry or canned dog food (much like we could technically survive on a lifetime of eating potato chips every day), they experience vast health benefits when they eat fresh, human grade food. Fresh food means real ingredients you can actually see in your dog’s bowl. Goodbye, mysterious brown balls of kibble. Protein sources in dry food that have not been approved for human consumption are much lower quality than fresh, unaltered, lean, human grade meats. With fresh food you can always see how much meat and fresh produce is used, whereas most commercial dog foods are extremely processed and can be loaded with hidden ingredients and additives that have been known to cause health issues. Popeye was right: eating spinach helps build strong muscles and promotes better health. Your dog can’t scarf canned spinach like the Sailor Man, but a fresh diet produces the same benefits. Human-grade food made with high quality ingredients help build strong immunity and increased vitality. Even senior dogs show an improved range of motion and increased playfulness after switching to a fresh, human-grade diet. The protein and natural antioxidants found in high-quality, fresh food also helps fight ailments and illness. Because commercial dry food is cooked at such high temperatures, the natural nutrients in any individual ingredients are destroyed and cannot provide these regenerative properties. Many ingredient lists on commercial pet food bags bulk up the protein percentages and don’t clarify the quantity of each ingredient. This means that the healthiest-sounding ingredients could be used in negligible amounts. Similarly, when a dog food bag claims that it contains 30% protein, it doesn’t mean it’s all digestible. Your dog’s system wasn’t designed to consume the bulk of the ingredients found in dry food, and they end up turning into (smelly) heaps of waste. Switching to fresh, highly digestible, human-grade food results in fewer and smaller stools. Food is digested properly, nutrients are directly absorbed, and you get poop bags for days. Many dogs suffer from skin issues like itching, rashes, and dry coats. While pet parents often chalk these symptoms up to allergies, many skin problems can be caused by the large amounts of fillers in processed, dry dog food. Fresh, nutrient-rich diets with essential fatty acids (usually a combination of omega 3, 6, and 9) improve skin and hydrate coats, leaving dogs so soft you’ll never want to kick them out of bed. Switching your dog to a fresh food diet helps maintain a healthy body weight, which has been linked to a 20% longer lifespan. Think about it: a human diet consisting primarily of processed foods would leave you sluggish, overweight, and at risk for host of health issues. Commercial dog food contains fillers and preservatives that can affect your dog’s health over time, whereas a fresh, human-grade diet produces increased energy and improved long term health. A true fresh food diet would have no additives or preservatives. Any alteration in dog food is generally meant for the convenience of manufacturing (a longer shelf life) or marketing for humans (i.e. food coloring, carrageenan, or xanthin gum used in kibble to make it look more “attractive.”) FYI, dogs can’t see colors. Many fresh, dog-friendly foods are already in your kitchen, making them an easy addition to your pup’s current diet. Just be sure not to add any more than 10% of their caloric intake in fresh food (or treats), to avoid unbalancing their meals. 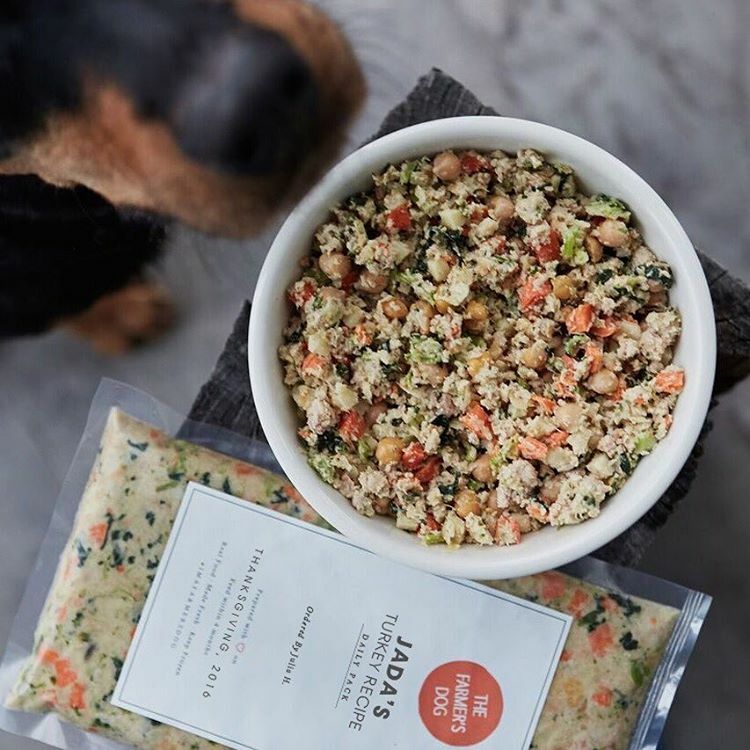 If you’d like to incorporate more than 10% fresh food in your dog’s diet, there are nutritionally balanced fresh dog foods available that can be sent right to your door. Does your dog have a favorite human food ingredient? Share it below! Great article!! Is celery ok? It makes the best crunchy sound. My dog Jocie loves this food, she can’t wait to get her next meal. So happy we discovered farmers dog! My dogs Jax and Beau LOVE their food! It is so funny to watch how patiently they wait for the other to be done so they can lick each others bowls! One is definitely more food driven than the other, but both love peppers, carrots, apples are a favorite. I do also give them more traditional style treats like, Bison treats by Nubz and peanut butter cookies by Buddy Biscuits. I try to buy quality dog treats, but with so many of them out there I am open to suggestions. They also love antlers to chew on. Love everything about this company. Customer service is beyond A+. My finicky dogs literally will now not leave the kitchen as they want more!! They lick their dishes clean with every meal. No more do I have to get on the floor with them and beg them to eat by hand feeding them. THANK YOU for a wonderful food service for our beloved dogs. You can make your own dog treats. That way you know exactly what they are getting. So many additives in processed dog treats. I have made some. Pinterest has a lot of recipes, some only use three ingredients. We couldn’t agree more! What’s your favorite recipe?? I love the idea to choose dog food that promotes healthy digestion. My dog has been acting really sick recently and it has me concerned. I definitely think that we need to find much better dog food to help him to feel more energized and playful. Apple slices and carrots are Sunny’s favorite go-to snacks. She also gets home cooked chicken pieces (very small) as training treats. I try very hard to keep her healthy! My dog George loves a lot of different kinds of fresh food. Pineapple, mango, cantaloupe, peanut butter, etc. His favorite? I don’t know. Maybe fresh meat.